Senda El Retiro is the second botanical ornithological park in the world, a place to enjoy the beauty and the entertainment that this place can offer us, enjoying the varied vegetation and its exotic fauna, an ideal park to visit with the whole family. This park has big historical gardens of varied flora brought in from all over the world where we’ll even be able to find Jurassic species such as the Cica Revoluta. In this park we’ll find one of the biggest collections of birds, we’ll also find butterflies, mammals, fish and reptiles. Keep on reading to discover more about this botanical park. The first thing that will capture our attention in this park will surely be the great botanical collection that we’ll find, some of these species are hundreds of years old, being originally from this place was built. It accurately replicates, in some areas, tropical and subtropical forests for the suitable coexistence of all the animal species that live in the park. The aquarium there is equally popular, with species of fish from all over the world, from both freshwater and saltwater, a butterfly park and a natural habitat area for reptiles and frogs where we’ll be able to observe them in their own environment. The Senda El Retiro botanical park is open every day from 10 am onwards and is located in Churriana. 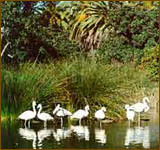 This botanical park is situated only 5 minutes away from Malaga airport and 35 minutes away from Marbella.